The main goal of the SLA management system is track compliance of the agreement. And the fundamental criteria of the SLA tracking is which elements must be tracked. If we talk about SCSM 2012 then this criteria handled by queues. All other parameters like calendar, metric and SLO are very simple and has no any interesting parameters. But queues is a powerful instrument for SLA management. The queue sets on which object will applied one or other SLO object. It can be (even must be) written small book about queues and how we can use them in SCSM but in this article I will describe only small part regarding to SLA management system. Count of the queue and complexity of it membership rule affect performance of the SCSM server and database. 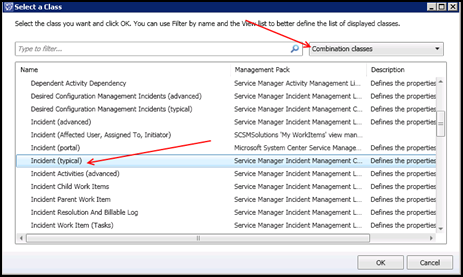 Unfortunately, with SCSM console you can use only dynamic membership rules. But you can always export management pack with queue and change it as you want. As I just wrote above, for dynamic membership you must define the membership rule. The membership rule is just a set of criteria used by SCSM engine to populate queue with objects. Unfortunately, in most cases, the administrators of SCSM using the simplest criteria like “Urgency = High and Priority = High” or similar. But membership rule allows us to use much more complex criteria. We can use not just a property of the target class, but any relationship for selected target class. 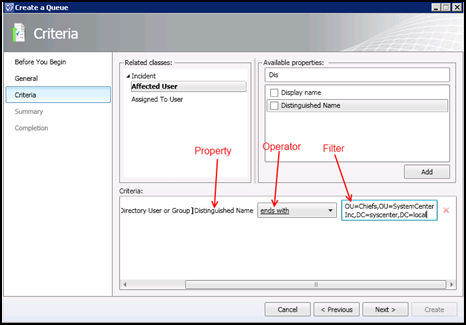 Do you have “VIP User” property in your User class and want to have queue with all incident where affected user is VIP user? No problem: just select combination class “Incident (typical)” and use the Affected User relationship and any properties of the User class for your criteria. Do you want to have a queue with all service requests what affect the given Business Service? No problem but little bit more complex. 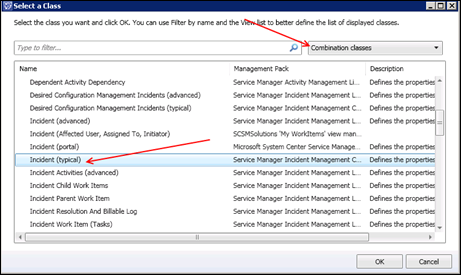 Just create your own combination class with “Affected Configuration Items” relationship with restriction to Business Service class. With combination classes we can use any nesting level. As example you can create combination class for service request with affected business service and add “Service owner” relationship as child. In this case you can build queue to get all service request where owner of the affected service located in given organization unit or worked in given company i.e. you can use any property of service owner. Also you must note what you can use relationships not only from Source to target but vice verse too. As example you can create combination class for incident and add “Has parent work item” but set direction from target to source (in this example the Target is child incident and the Source is parent) with SeedRole=”Target”. As result you can use this combination class to create queue with all incident which has parent incident with Urgency=”High” (or you can use any other properties of the parent incident). Create combination class (or “type projection” in terms of object model) with necessary relationships and restrictions. You can do this with any text editor or with VSAE. Set exclusions for queue. This can be helpful if want to exclude some object from SLA management. 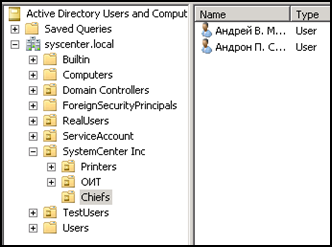 In other word you can use all features of the group membership engine in OpsMgr\SCSM. The second rule – use combination classes with fewest possible number of relationships. And you must never use “* (typical)” combinations classes in you queues. The third rule. If you have a lot of queues and groups then you can try increase calculation interval. But keep in mind what this affect the SLA workflows because as you know from part 2 the SLA’s workflow runs after queue recalculated and object added to queue. ATTENTION! All information below provided as is without any warranties. This approach is totally unsupported by Microsoft and\or by author. The author is not liable for loss of information due to the use of these recommendations. A long time ago I’ve published article about Pause status of the SLA in SCSM 2012. This article is very popular, but I couldn’t publish any information about how to do that until Microsoft approved it. Now I have a “green light” and it’s time to open Pandora’s box. If you read carefully Part 1 and 2 then you already note to some properties of metric object and workflows what regarding to pausing SLA. This properties and workflows are not supported by Microsoft but worked in simple scenarios. To use pausing SLA in SCSM you must define to criteria: when it should paused and when resumed. This criteria is absolutely the same as in all other workflows (notifications) and allow you to check values what was before change and after change. Note: for all below I will assume what your already have working SLO and you want implement pausing only. The simplest way to create criteria for our SLA pausing workflows is create new subscription with necessary criteria in SCSM console. This notification must be created in same management pack with SLO object and must be disabled right after creation. After that you can export this management pack and copy criteria from subscription rule to SLA workflow. Also you must copy-and-replace <UpdateInstance> element for %SLO_NAME%-ResumeEvent rule but swap <Operator> (Equal to NotEqual and vice verse). Everything you need is export management pack and find workflow by ID. You can use any criteria for pausing\resuming SLA and that can help you to build any SLA. But keep in mind what SLA pausing is not supported by Microsoft so you must test each criteria before implement in real life. Note: There is one more way to implement pausing. You can set the PauseEventCriteria and ResumeEventCriteria properties of the Metric object with SDK. In this case this criteria will be used for each SLO created based on this Metric. The SLA system in SCSM 2012 (and SP1) are very powerful. The entire book can be written about SLA and this series of article just small part of the SLA system. After you impellent your SLA you should create reports and\or OLAP cubes to analyze you SLA metrics. But you can use SLA system not only for SLA itself. For example, you can use SLA system to set maximum period for approve process (“this review activity must be voted for 3 days or…. [do something useful]”). You can run any other workflow when SLO object changed they status to Warning or Breached. For example above you can run PowerShell script if review activities still not approved and auto-approve them. So don’t be a fear to test any SLA scenarios. I have a question for you: We’re using 5 priorities (5 queues and SLOs), but I’m thinking that instead of adding this feature for the 5 of them, I could create a sixth queue and SLO called “All open incidents” to include all 5 priorities and add the pause/resume functionality there. Have you tried something like that? Any recommendations? Disregard my previous comment, I’ve just figured out that these workflows are tied to each SLO object id… I’ll build 5 of them. Why pausing manually with SMLets (setting status to Pause and writing in PausedDate) does not Resume afterwards via resume workflow? I need it because if someone puts ticket “On Hold” before SLO objects are generated for that ticket, they do not go “On Hold”, as there is no event firing the workflow, so I do it with Orchestrator instead. If you can describe what exactly you do with SCOrch then maybe I can help you. But keep in mind what Pausing\Resume workflow do the big job around SLA. It’s not just set status\paused date. It’s also the calculate date and other things. And I still thinking the same )) I have no “real live” project with SLA pausing. I have run through this, and I get the paused state, but my target dates do not seem to change. Any ideas what I could have missed? Audrey, I am facing the same issue, did you manage to solve it at your environment? Can i delete the subscription that I made after copying the criteria from it? Or should I just leave it disabled? Yes, of course you can delete subscription. I am running that ps script but its throwing the error as below.. The pause-resume workflow works for some time but later it stops working for some reason. When I checked the MP, I realized that the 2 enabled lines in the XML had no criteria in it. Both of them turned into their default state. I tried this in 3 project but experienced this issue in each of them. Looks like you changed your SLO using the Console. In this case Pause and Resume workflows will be disabled. Are you planning to post some MP in Technet Galery with this stuff? Thank you. No. And what exactly do you want to see at TechNet Gallery? Maybe a MP that enables the SLA pause feature, it would be awesome. Anyone have this randomly put tickets in a pause state unexpectedly? My IRs are paused as they should. I can see the timer stopping while its paused, but as soon as I activate it again, it includes all the time from when it was in a paused state. Thoughts?